Anaheim was the first city in Orange County to become incorporated in 1857, when James Buchanan was America's 15th President. George Hansen, a surveyor, saw that the nearby Santa Ana River would be the major source of water and irrigation for settlers who wanted to farm, and so he helped establish "The Mother Colony" which became Anaheim. The Mother Colony started out as a wine center, but the grapes were killed of by blight in a short while. The short lived wine community later gave way to citrus grove plantations. There are may Pioneers in Early Anaheim, such as The Hansens, The Wheatons, and Rudy Boysen (inventor of the Boysenberry), who helped The Mother Colony to thrive before Walt Disney came to Orange County, and changed Anaheim and Orange County forever. 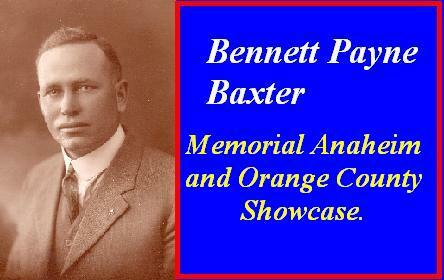 One of the Major Pioneers in Anaheim's Earlier years was a man by the name of Bennett Payne Baxter. By the first part of the 20th Century, Anaheim was inhabited by Orange Groves and the landowners who farmed them. Ben Baxter was one of those major landowners. He not only made it his aim to succeed in his business, but help his fellow landowners and competitors succeed. He came up with great ideas for irregating the Orange Grove and came up with the right tools and supplies to put his ideas in motion. He shared his ideas with other other landowners and sold irrigation supplies to them. Orange Groves became a thriving busness in Anaheim during its earlier years. Ben Baxter played a major role in Anaheim's History. A street that runs along Edison Park in Northeast Anaheim carries his name (Baxter Street).